"The biggest difference is the belief that David had. If I wanted to do something, David would help me figure out how to do it." On September 3, 2011, Jacob Rainey stepped on to the practice field as the quarterback for Woodberry Forest School, one of the top high school football programs in Virginia. When the scrimmage was over, his life had been changed forever. Jacob suffered a severe injury to his right leg, which led to an amputation through the knee. Determined to continue with football, Rainey entered rehab in Charlottesville, VA, but found that the therapists' expectations didn’t match his goals. A treatment plan consisting mostly of walking up and down a hallway with crutches was never going to allow Jacob to return to the sport he loved. Unknown to Jacob, Jack Ackerly - former rector of UVA and a big fan of Virginia high school football - heard of the injury and amputation. Jack was recovering from a stroke, and receiving therapy at the Gait Center in Richmond. He felt strongly that Jacob should be at the Gait Center also, and reached out to the rector at Woodberry Forest. This turned out to be a pivotal decision. Jacob came to Richmond, and told the Gait Center therapist, David Lawrence, of his goals. It was here that Jacob was finally treated like an athlete in recovery, rather than a young man who had to learn to give up his dream. Pursuing that dream required a great deal of drive and determination on Rainey’s part, and some experimentation to find the prosthetic solution that would allow Jacob to compete as a quarterback. The Gait Center collaborated with Powell Orthotics and Prosthetics to fit him with the right equipment to continue to train as an athlete. Jacob started the first game of his senior year, just as he had hoped, and helped lead his team down the field for a touchdown. Later the same season, he played in the biggest game of the year, the annual meeting with Episcopal High, an intense rivalry that goes back to 1901. 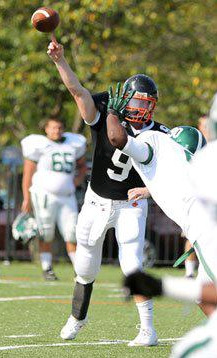 Rainey threw two touchdown passes that day, and led Woodberry to a victory. After Jacob's senior year at Woodberry, he went on to the University of Virginia, where he developed into a student coach. Upon graduation from UVA, he was offered a position at UCLA, where he is now on the coaching staff as an offensive quality control assistant. Jacob Rainey’s story is a strong affirmation of physical therapy that doesn't place arbitrary limits on patients’ goals, but instead works with them one on one, adaptively and creatively, to achieve those goals. Jacob is not alone. Check back next month to see how the story continues with Cor'Rales Dupree. All images courtesy of Jacob Rainey. *Correction: The story originally stated that Jacob received a scholarship from UVA. Jacob's scholarship was from an outside source, so the paragraph was edited and the incorrect sentence removed.